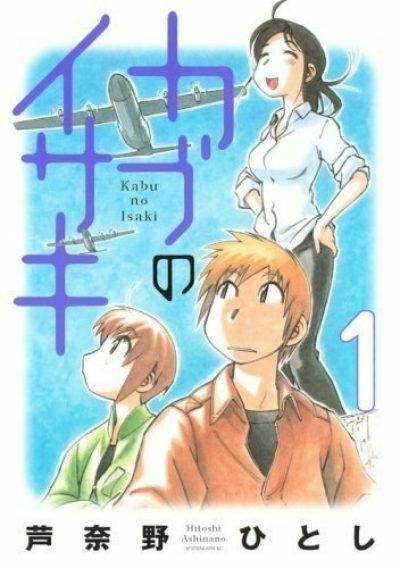 Hitoshi Ashinano’s Kabu no Isaki—Isaki of the Cub— was serialized between 2007 and 2013 and subsequently collected into six volumes. I am unaware of a North American edition. Which minor fact did not deter the intrepid reviewer. At first glance, not much has changed in the (unspecified number of) years between our era and young Isaki’s. People still need to work, which means they need some means to get to work. For Isaki, work and transportation are one and the same. Neighbor Shiro allows Isaki the use of her aged but still reliable Piper Cub airplane. In return, Isaki uses the plane to run errands for Shiro. First glance is, of course, misleading. Isaki negotiates with Shiro for access to the Cub, then takes it for a spin. Rather ominously, given Shiro’s warning to Isaki about his foolhearty flying, the plane handles in unexpected fashion. Why? The answer is also unexpected. The distances in this episode might seem to be typographical errors. They are not. For reasons that I imagine will NOT be explained later, the Earth’s linear dimensions have expanded by ten, without any of the inconvenient complications one might expect. Accompanied by Shiro’s younger sister Kajika, Isaki ventures to an airfield unfamiliar to him. Kajika, an experienced pilot in her own right, knows the location quite well, which is why she is so gleefully anticipating Isaki’s reaction. Distances are not the only aspects of this world that have been greatly inflated. The simplest explanation is that the human population has somehow been belittled. Once again declining to inquire too closely about significant details of his errand, Isaki delivers a load of pears to an unexpected trading partner. Again, Ashinano has imagined a giant aircraft in endless flight. LTA, rather than HTA, but encountering this in two successive works leads me to suspect it is a theme Ashinano enjoys. As far as I know, he has never yet made such a vessel the primary focus of a serial. For some, the peculiar mirages spell doom. For the people of the Valley of the Lens, they are a wonderful business opportunity! I would guess that if the whole world is ten times bigger, simply avoiding the valley and its mirages may not be possible. It may seem a bit heartless to take advantage of the crashes caused by the mirages rather than setting up some sort of mitigation system, but really it is no worse than using a lighthouse to draw passing ships onto the rocks. Kajiki has an odd reluctance to bath while Isaki is around, which just goes to prove modesty is odorous. Shiro and Isaki share a quiet drink. Shiro suggests she and Isaki go away together, an offer that seems innocent enough. Isaki is underage—but that does not stop his neighbor from offering him tequila. Her interest in him may not be entirely neighborly. Isaki is shrouded in prodigious masculine obliviousness, but Kajika picks up on the subtext (even though she is not in the room at the time). While Kajika is, of course, completely uninterested in her older sister’s plans for Isaki, she still manages to learn more about what those plans might be than the increasingly nervous Isaki does. Ignorance in this case may be the best option; any warning would only make Isaki even more nervous. 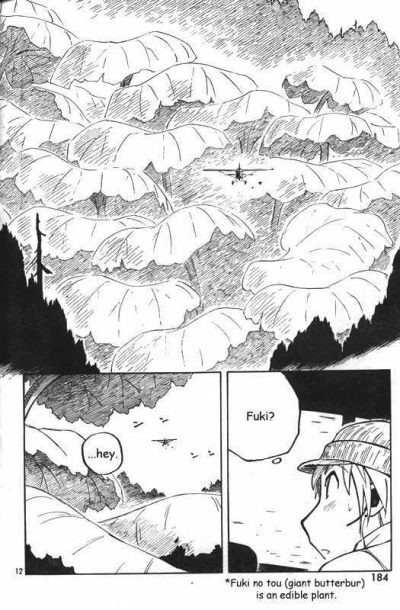 The art in this series differs from that in YKK; it is simpler. This is most evident in the faces, which are so abstracted as to be nearly featureless. It’s still possible to tell people apart, however. The weirdness in Kabu no Isaki is thus far more low-key that it was in YKK. Distances (and other linear dimensions, like certain building heights) are ten times larger than they are in our time, but why this is so or when it changed is unclear. Some living things have been affected. Others, like humans, are unchanged (or alternatively, humans were shrunk and everything else is the same). This does not have quite the same fishhook-in-the-brain effect of YKK, but I am still curious how various threads play out. I wonder how the whole Isaki-Kajika-Shiro triangle will resolve, I am resigned to the likelihood that the worldbuilding weirdnesses will never be explained. I am unaware of a North American edition.